Hello Doodlebug friends. I know it seems like a long way off, but before you know it Christmas will have sneaked up on us!!! I've always thought it would be fun to trim a tree in DB ornaments. 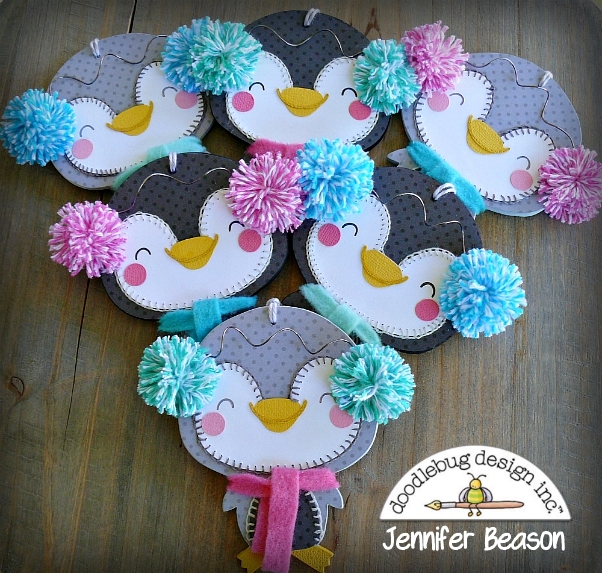 So today I will be sharing how I made this set of fun penguins. The ornaments were made using a penguin cutting file, twine, some felt, wire, Doodlebug Petite Prints patterned papers and cardstock. Using your digital cutter, begin by cutting the base of the penguin out of chipboard or cardstock. Use this as your stencil to trace the outline onto 1/8" thick wood. Cut the penguin out using a scroll saw. Sand the edges and drill a small hole to add string later. Using the colors want, cut out the body, feet, tummy, head, beak and small circles for the cheeks. Glue the body and feet to the wood base. Paint the sides of the wood. Stitch around the penguin's head using some embroidery floss. Glue the head in place, then glue on the beak and cheeks. Next stitch around the tummy and glue in place. Use a sealer like mod podge to protect each ornament. Allow to dry. Next, cut strips of felt to create scarfs for each penguin. Tie them in place. 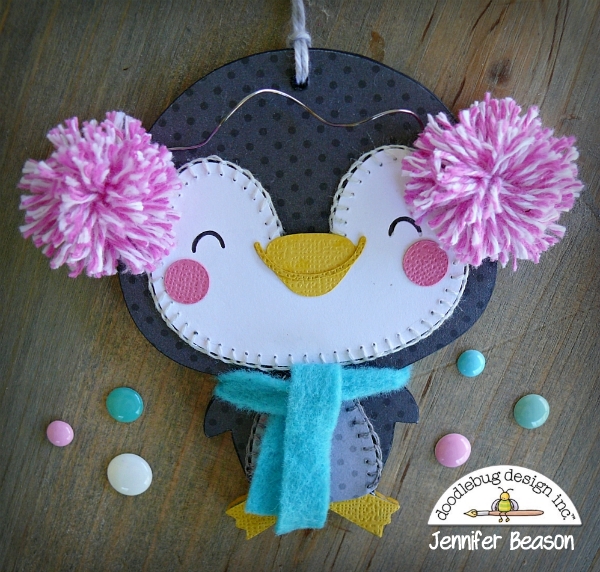 Use some thin wire and pom poms to make the ear muffs. 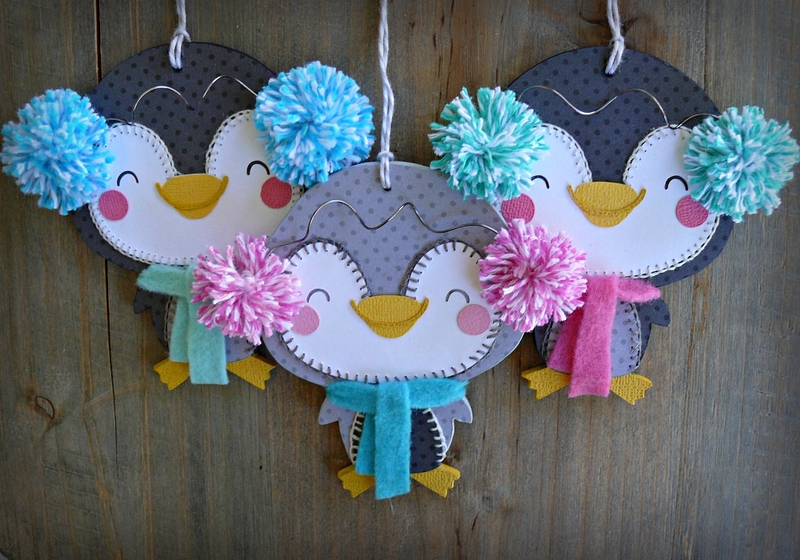 (I used twine to make my pom poms, but you can use pre-made ones) Use hot glue to secure in place. Add some twine for hanging on tree. Here are a few more pictures of them all finished. 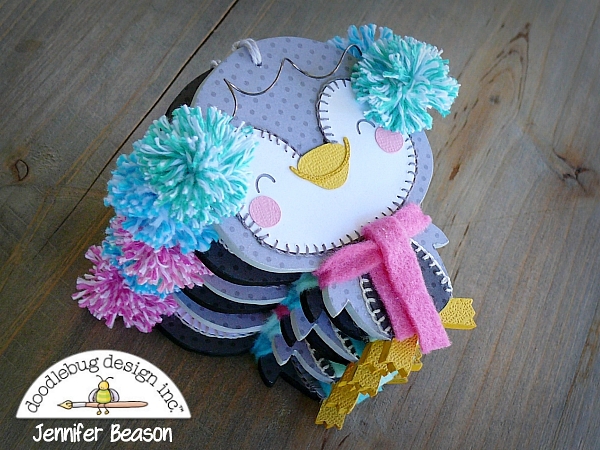 Remember with so many cute Doodlebug cutting files, the theme possibilities are endless. These are sooo adorable Jennifer!